Kuriyama - GTF PVC Food Grade Lightweight Blower and Ducting Hose - 3 in. X 50 ft. - OD: 3.46 in. • FDA - CFR Title 21 Parts 170 to 199. • USDA - For use in Federally-inspected meat and poultry plants. • 3-A Sanitary Standard - No. 20-20, Multi-use plastic materials as product contact surfaces in equipment for production, processing and handling of milk and milk products. • NOTE : Available with embedded copper grounding wire upon request . . . Check with factory for minimum quantity requirement. 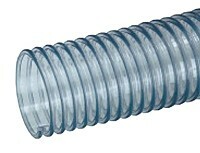 • In- plant blower and ducting applications requiring a food grade hose. Available with embedded copper grounding wire upon request... Check with factory for minimum quantity requirement. • Clear PVC construction - complies with all applicable FDA (CFR Title 21 Parts 170 to 199) and USDA (For use in Federally- inspected meat and poultry plants) requirements and 3- A Sanitary Standards (No. 20- 20, Multi- use plastic materials as product contact surfaces in equipment for production, processing and handling of milk and milk products) ... allows visual confirmation that material is flowing. • Exposed helix design - provides high abrasion- resistance with increased flexibility ... slides easily for ease of handling. • Smooth bore construction - eliminates material build- up.